Heron's self-moving stand indicates not only his interest in the theater, but also his special fascination with automata. It was able to move across the stage, in different directions, seemingly all by itself. Heron designed variations on the one shown here, such as stands that carried mechanical puppets and even stands that boasted their own miniature theaters: one of these would roll onto stage before a show, doors would open and close by themselves, tiny altars would light up and mechanical figures would move about, and then the stand would roll offstage.The secret of Heron's self-moving stands was gravity. 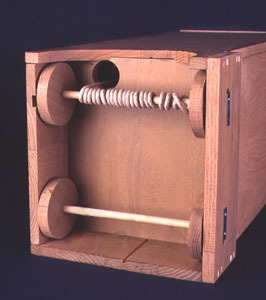 A large weight connected by ropes and pulleys to the wheels and gears rested on top of a container of grain or sand. As the sand flowed through a sinkhole and into a compartment below, the weight would sink, making the ropes taut and turning the wheels in the interior. 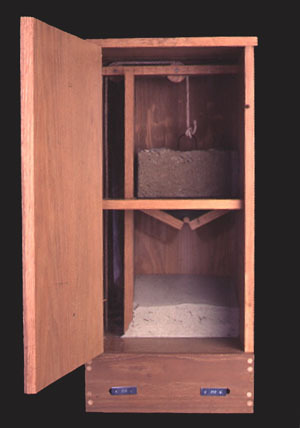 The process could be altered by using different amounts of sand, depending on how long a performance was desired.